COMPACT FOLDING DESIGN - Kids can fold and store the shades in their pocket without loosing them, giving the little ones an independence boost. With FLEXIBLE SILICONE frames, these sunglasses are much more solid that you think! EXTREMELY CUTE SUNGLASSES - Our shades are a great match for toddlers and young children (2 - 7 years old). 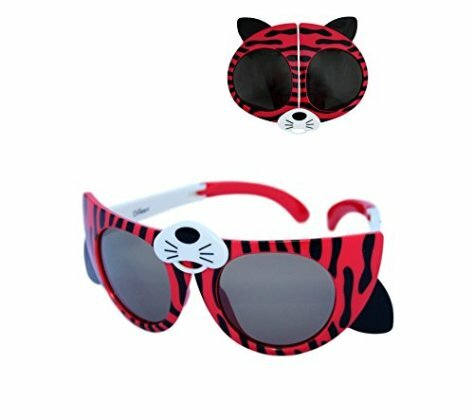 Both boys and girls love these kitty cat shades that come in pink, red and blue. BUY 3 GET 20% OFF - We love our customers and want them to love us too. If you buy 3 or more of our sunglasses you can immediately save 20% at checkout (with the coupon code VGDCIX7J). Great gift idea for birthday parties!